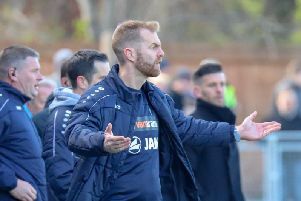 Saturday afternoon saw more twists and turns in what has become a thrilling battle for the National League North title. Harrogate Town beat struggling Gainsborough Trinity 2-0 and looked to be heading back to the top of the table, with rivals Salford City four goals down at Kidderminster Harriers. Incredibly, the Ammies scored four times in the final 10 minutes to grab an unlikely draw, meaning that they still lead the way at the summit, by just a single point. However, it is now advantage Town, with Simon Weaver’s team having a played a game less and boasting a far superior goal-difference. Their fate is firmly back in their own hands. “It’s a great result when you’re 4-0 down, a superb effort, but from our point of view it’s a draw and we’ve won,” Weaver said when comparing Salford’s stunning late fightback with his own side’s result. “It’s another two points gained and we’d have certainly taken that before the start of the game. Town’s victory over second-from-bottom Trinity was far from straightforward, with the hosts indebted to goalkeeper James Belshaw for a string of fine saves. Weaver’s men started on the front foot, but it was Gainsborough who went close to scoring first as Liam Kitching’s sliced clearance flashed past the face of goal and behind for a corner. Four minutes later, the visitors found themselves with a three-on-one advantage on the counter attack, though gloveman Belshaw defied the odds to beat away Nathan Jarman’s strike. Town then broke the deadlock after 18 minutes of play when a clever touch by Dominic Knowles released Jack Emmett behind the defence, and the midfielder beat Henrich Ravas from a difficult angle. Knowles almost doubled the home lead six minutes later after turning neatly and trying to find the far corner with a low drive, but Ravas tipped past the post. Seconds later, Trinity almost pulled level as Ben Hinchcliffe stole possession just outside Town’s area and hit a ferocious shot towards goal, but Belshaw showed great reactions to tip over the bar one-handed. Two minutes after the re-start, George Thomson went agonizingly close to finding the back of the net when cutting inside on his left foot and striking the inside of the post, with Joe Leesley unable to turn in the follow-up on the stretch. The scores could have been level soon after though as Belshaw again did well to keep out Jarman’s strike, and even better to smother Hinchcliffe’s rebound. It was then the turn of Leesley to keep Gainsborough at bay as the winger hooked the ball from the goal-line when defending a corner. Despite the visitors going close it was Town who struck next as Warren Burrell burst into the area from right-back and squared for Beck to tap home in the 66th minute. That goal took the wind out of the Trinity sails, and Weaver’s charges were able to see out the rest of the game without too many problems. In almost the the last of the action of the match, substitute Jordan Thewlis sprinted through on goal before being brought down from behind, but no penalty was awarded. “It was a good, professional performance,” Weaver said of the 2-0 victory. “We had to dig in, defend well and Belly’s made a really good save in the second half, but we scored at the right times and we sewed it up well in the last 15 minutes. “We can’t just turn up and expect to roll teams over all the time. Next up for Town is a home clash with eighth-placed Spennymoor on Tuesday evening, 7.45pm kick-off.